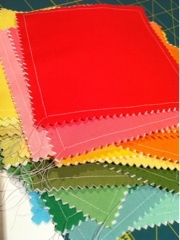 At the moment, my creative space is rainbow colored. 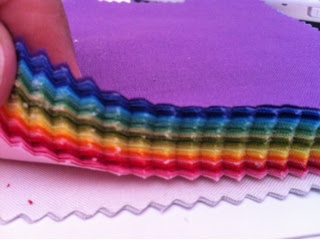 I feel like singing the 'Rainbow Connection' song by Kermit the Frog, as I sew... yes, I'm a little bit odd. I'm playing with charms of Kona cotton in multi colors and white. It's a fun process though I'm not sure where it's going yet. I'm just enjoying the ride. Do you just jump into a project and work it out as you go? Or are you a planner? I like to play around a bit. Sometimes I follow a pattern, sometimes I make it up as I go along! Have you seen the Rainbow Charm Swap that Lilabelle Lane is organising? There is a link in my latest post. I have a tendency to jump in and make it up as I go along but occasionally I'll follow a loose plan! I think I have one of those charm packs too. Can't wait to have the chance to play with them. I'm more of a planner, I want to know what I'm doing before I start, but I think maybe when I have a bit more creative time (I should stop setting myself deadlines) I'd like to have a go at just sewing and cutting and see where I end up. Sometimes I plan things to bits, consequently it isn't done in time if I'm on a deadline. Also I find that as I go I think of ways I could alter items to make them easier to use, more functional, prettier etc and then I want to change the original...immediately. I'm forming a habit of making a trial run first time round and then having 2 patterns of most things - the original and my 'personalised' one! Love those solids. I'm usually a planner, but I allow for some tweaking along the way. I love that Kermit the Frog song! Someday I'll find it, the rainbow connection, the poet, the dreamer, and me. I'm so new at this that I am a planner. Maybe I will get more adventurous a little later on. when I was doing creative projects on a regular basis, be it cross stitch or scrapbooking or baking experiments I found doing lots of planning helped me complete the project faster - I had everything I needed to hand and didn't get stalled half way in frustration. But the planning process was pretty boring. I jump in with all my clothes on usually! I am also new to sewing so I am just following patterns and trying out blocks.